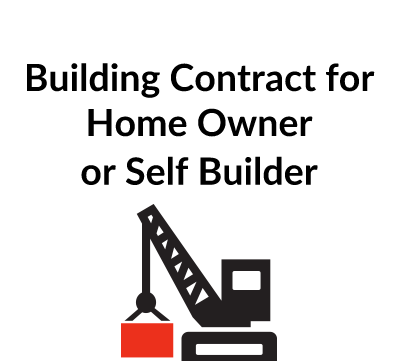 This Irish building contract template is for use in Ireland by a developer or home owner who appoints a building contractor for a new house or some other building project. It complies with the Irish Construction Contracts Act. It was developed in conjunction with SelfBuild Zone, a company that provides warranty insurance for home builders in Ireland and the UK. an Appendix with a list of details: completion date, insurance requirements etc. Schedules to cover the Specification, Price & Payment. general items – notices etc. We also have a similar form of building contract for use in England & Wales, document B152 5. 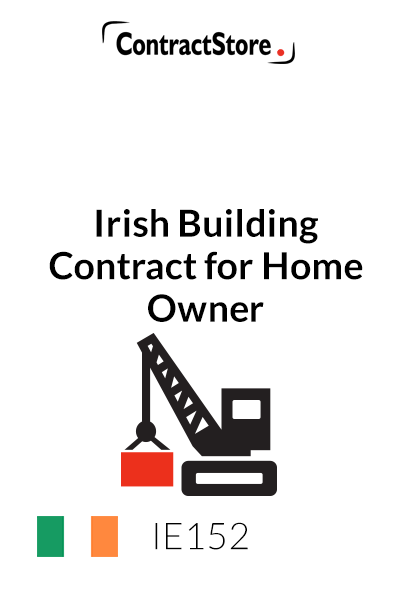 This Irish building contract is designed for use by home owner or developer in Ireland who appoints a contractor to build a new house or carry out other building work. It is designed to be compliant with the Construction Contracts Act 2013 which now applies in Ireland. Although the Act does not apply to the building of a dwelling of less than 200 sq. m for the owner, it contains sensible with regard to payment and resolution of disputes. 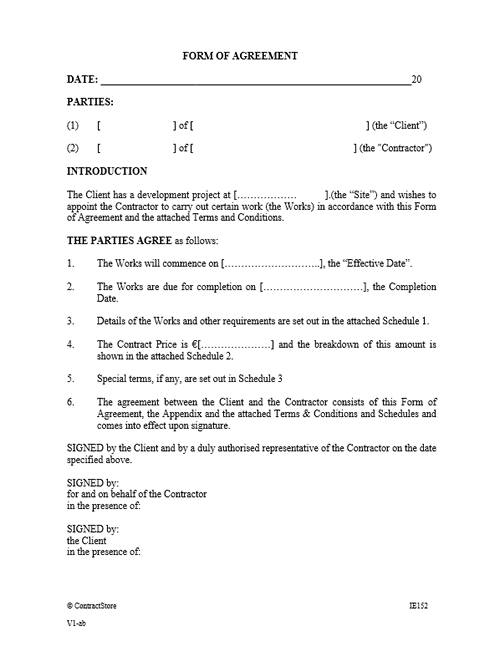 The contract is structured in a user-friendly style in four parts: a one page form of agreement that the client and contractor will sign, a set of (standard) Terms & Conditions, a one-page Appendix with a list of specific items such as the completion date, amount of insurances etc., and Schedules that should contain details of the project including the scope of work or specification, the contract price and payment terms. Clause 3 deals with responsibility for getting planning and other consents, and you should discuss this with your architect or builder. The Building Control Regulations allow an owner to opt out of Statutory Certification and if an opt out is decided, this will be shown in the Appendix. Also, clause 3 deals with the possibility of the client taking out a 10 year warranty with a company such as Self Build Zone. Clause 6 deals with price and payment. More details of price and payment will be in Schedule 2 but the basic arrangement provides for the contractor to submit regular payment claim notices for payment to the client – either monthly or in accordance with a payment schedule – and the client will pay within 28 days. If the client is not happy with an application, he needs to give notice with reasons before the payment date under clause 6.4. Late payment may entitle the contractor to claim interest under 6.7. These clauses follow the requirements of the Construction Contracts Act 2013. Clause 7 deals with change and delay. It is important to have a procedure for dealing with changes during a building project and this is set out here. Before implementing a change, the impact in terms of price and timing need to be assessed and, once agreed, the change should be confirmed in writing. We have a Change Confirmation Form that can be used for this. If the contractor is delayed for reasons beyond his control the contract allows for him to get an extension of time, and the completion date will then be adjusted. Delay may also entitle the contractor to extra money but we have inserted some wording in clause 7 that will restrict the entitlement to extra money. Clause 9 deals with completion and post-completion defects. Once the work has been satisfactorily completed, the client or his architect or project manager will sign a completion certificate. There is then a 6 or 12 month Defects Period during which the contractor has to remedy any defects that appear in the work. Clause 12.7 deals with suspension. This might be needed if, for example, the contractor is appointed but then some planning decision holds up the project. And the contractor has a legal right to suspend work in certain circumstances under the Construction Contracts Act which is covered in 12.8. Clause 14 contains a number of “boilerplate” clauses. Clause 15 deals with disputes and there is a three stage process: firstly, negotiation and, if this does not work, then either party can ask for adjudication which is in fairly short process and avoids more expensive and lengthy court proceedings. If adjudication does not resolve the matter, then the dispute will have to be referred to the courts in Ireland and Irish law applies. Alternatively under clause 15.4, the parties could agree to refer the dispute to mediation. Our form suggests using CEDR Ireland for this process: CEDR (the Centre for Effective Dispute Resolution) is long established in the UK and also has offices in Dublin. This will contain details of the project and the description of services will probably refer to drawings and specifications which contain the detailed scope of work. The more detailed the design and specification before work starts, the less scope there is going to be for uncertainty and the need for changes which, of course, will have an impact both with regard to price and programme.